Provocative huh?? What? What is this gal doing for all that is holy? I'm cruising with my navy blue banana bike, basket and Donald Duck bell. Cruising along the TCH (Trans Canada Highway) where I mostly rode my bike. Now before panic ensues it was in Little Rapids, NL. Population 100. Traffic was spotty at best but I do admit to playing chicken with a 18 wheeler more than once (DO NOT do this kids, you will lose). Some boys took my bike, did some jumps and broke the frame. Fast forward and a light blue 10 speed came into the picture, but at 15, I abandoned the bike. It involved biking, spotting a cute boy and a curb... But I digress. I decided I wanted to bike. Why? Because I want a motorcycle. If I can't hold up a bike, chances are good I am going to be crushed when I am driving a motorcycle. So I send out a plea to twitter and houseofpickles (if you live on twitter you get it) had a spare bike in her basement. Off I went, picked up the bike and brought it home. 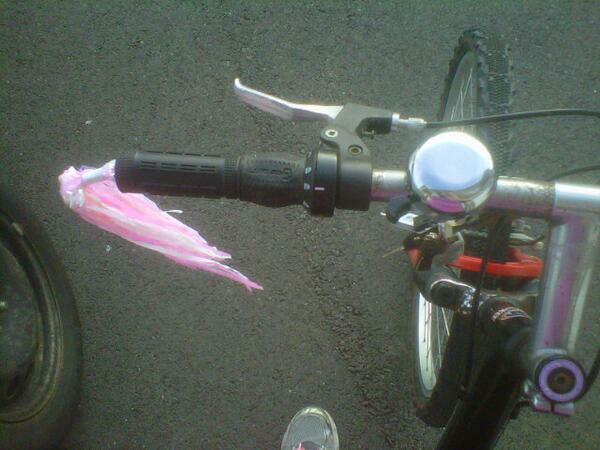 After some hard work and some bright pink sparkly tassels I was ridin'. With the exception of the 4 year old who brazenly cut me off and the devious parked car, I survived. Honestly, it's not like riding a bike - they're damned liars. There are roads and cars and other cyclists and children running hither and yon! But yet I tried again. 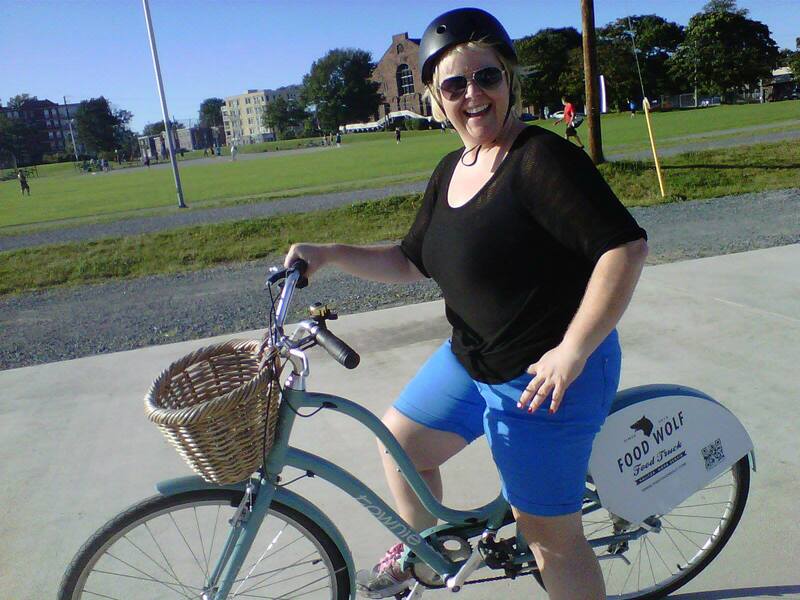 I never said I was rational so one day on the Link bus to work I decided to rent a bike at lunch and take it for a spin on the waterfront. I booked it, had my flats on and off I went. Wait - there's more to the story. The lovely lady at I Heart Bikes Halifax mentioned tracks on Marginal Road, I listened intently and felt OK that I could handle it. Now... off I went, in a skirt (oh shush I know what I am doing). Oh yes, I am fine. You went over the handle bars. Exerpt from conversation with a man in a Ford Escape on Marginal Road. 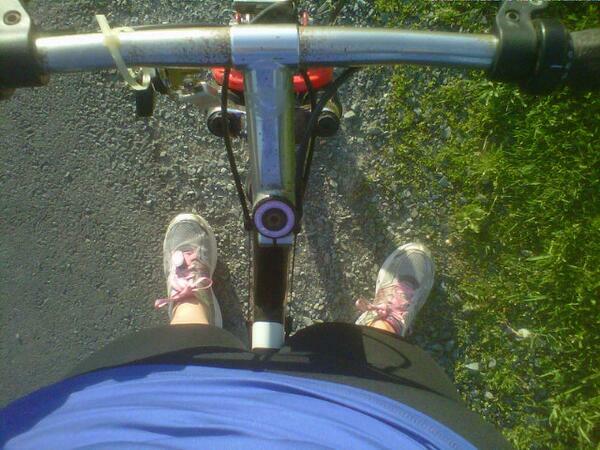 Yes, the picture is a live tweet right after I dropped the bike back to the shop, after I got back on and biked back. The folks at I Heart Bikes were great - worried about me, but great. What to do, what to do. I hash tagged (#) it #biketragedy2013. Concern was swift and supportive. Was biking now out of the question? Nope... I took a class with my pal Krista Spurr (krisp131) at the Oval and learned things like arm gestures (no, not those ones - I have a PHD in those). A couple things stick out. I'm still biking. 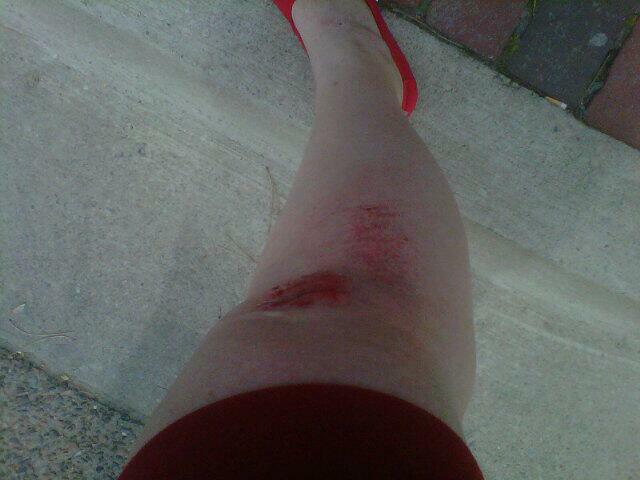 The confidence is coming, I won't be biking downtown Halifax anytime soon though. I want to make sure you're okay and also laugh. If you're going to get hurt, might as well write about it, right? Laura... It was one of the best laughs I had in a long while. In all seriousness my life as a leg model is now over.